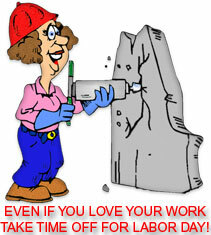 Labor Day graphics and comments for use on your personal and non-profit web pages. Images include plenty of laying around on the beach and fishing. After all, Labor Day is the unofficial end of summer. 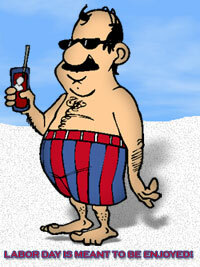 Play, relax and enjoy because old man winter is just around the corner. 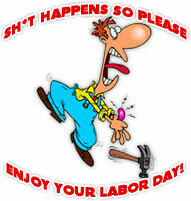 Labor Day is the First Monday in September. Master chef grilling on Labor Day. 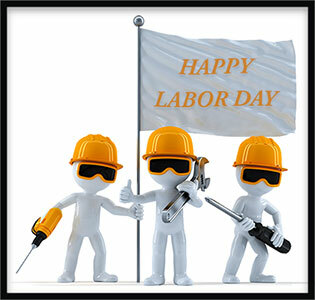 Happy Labor Day Flag with 3D workers. Stuff happens so get out there and enjoy Labor Day. Happy Labor Day from a bunch of hard workers. Happy Labor Day with glitter animation. Take the time to enjoy your Labor Day. Happy Labor Day with glitter. Labor Day on the Stars and Stripes. Happy Labor Day with animation and shadows and an American Flag overlay. Happy Labor Day in red, white and blue with animation. Construction worker that is working on Labor Day. Labor Day is a good day for canoeing. 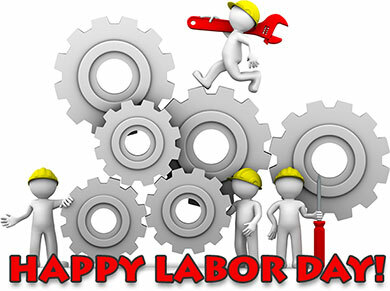 Worker connected to the world - Happy Labor Day! Happy Labor Day from a hard worker with a power drill. Labor Day with white and blue animation. Nothing like a sunny day on the beach with no work because it's Labor Day!. Enjoy. 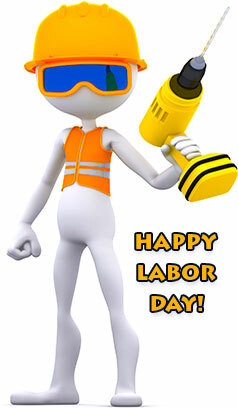 Happy Labor Day with animation. Having a bad day at work? Labor Day is just around the corner. 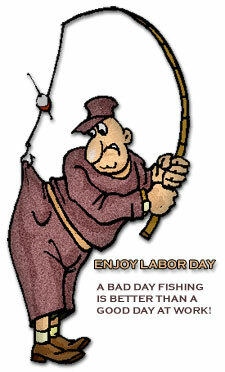 Enjoy Labor Day. A bad day fishing is better than a good day at work.